Illusive. Has been seen on occasion scurrying from bush to bush. Rarely flies. 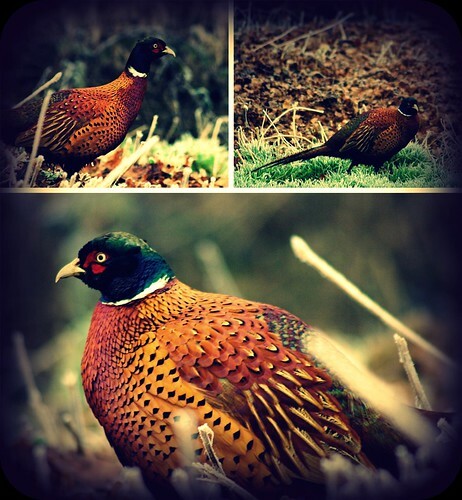 According to Brits, you often see pheasants in the English countryside. It has taken me three months to capture one though. Fun fact: Pheasants are not actually native to Britain, but to Asia. It was brought in as a game bird in the 10th century, where it eventually naturalized. King George V shot over a thousand pheasants out of a total bag of 3937 over a six day period in December 1913, a total which still stands as the British record bag. I only shot one. And it wasn’t even with a gun. But after I shot it, I did chase it off of the property. That definitely made up for all the times it made me chase it into a bush in the months prior, just to get a shot. This entry was posted on Saturday, January 3rd, 2009 at 11:31 amand is filed under nature, Photography. You can follow any responses to this entry through the RSS 2.0 feed. You can leave a response, or trackback from your own site.